Sometime in March 2016, we started with the series Risk Management: Good to Great. The centre piece in the diagram above is, of course, the set of risk management practices in the organization. 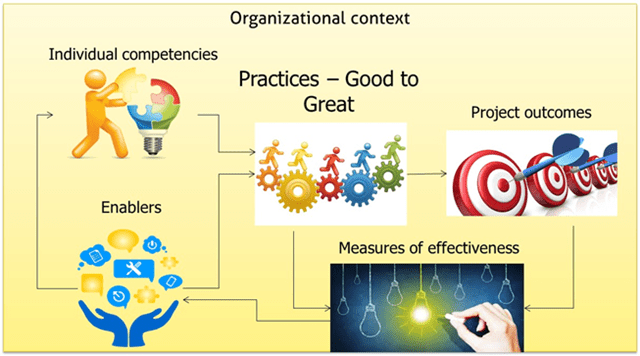 Around this centre piece, there are a number of related elements: Organizational context, Individual competencies, Enablers, Measures of effectiveness and Project outcomes. We talked about Organizational context in Part I in addition to an introduction to what makes practices “great”. In this article, we will cover key enablers for practice effectiveness. People always FEEL the culture of their work place, don’t they? While there may be awareness of text book definition of organizational culture being “a system of shared assumptions, values, and beliefs, which influences how people behave and perform their jobs in organizations”, at the ground level, it is what people see day in and day out in their work place in terms of “the way that things are done around here”, what is kosher and what is a no-no. People adapt their own behavior based on what they see around them every day. Organizational culture has a strong bearing on risk management. In some organizational cultures (say, in start-up’s), a strong appetite for risk may be evident. In others (say, a large financial institution in a regulated environment), it would be the reverse. The culture may even influence the choice of new initiatives and selection of projects to undertake. So, organizational culture seems to be a “given” for the project manager in managing risks, is it not? However, consider situations when a start-up attempts to develop solutions for a large financial services organization or when a large financial services organization undertakes a new project driven by challenging time-to-market considerations requiring a higher risk appetite than the norm. In such cases, the leaders and the project teams need to recognize that “this” project is different from other “typical” projects and adapt their risk management strategies. Having said that, at an operational level in organizations, delivery leaders need to foster an environment of open discussion of risks and not view / propagate a culture of risk management being something for wimpy project managers who cannot get things done! So, there is indeed a need to address the cultural aspects as an enabler for risk management and not just a “given”. Even if the organizational culture is supportive and healthy, good intentions of the leadership need to be translated to actions in setting up the necessary infrastructure for risk management practice. Policies, standards and guidelines for risk management are the basics that need to be in place for a uniform style of risk management practice across projects. For example, different projects need to be conveying the same meaning when they talk of risk probability or impact as being “High”, “Medium” or “Low”. Formal procedures are necessary for project managers to obtain explicit funding for their risk management actions. A basic risk repository needs to be maintained which provides a reference for the type of risks depending on the nature of projects and project environment. Infra also should include mechanisms for sustenance of risk management practice, periodic review of effectiveness and funding generic improvements based on recurring risk root causes or risk sources. Support structures such as a Project Management Office and a Project Management Community of Practice are also very useful aspects of infrastructure to support projects and specific assistance in risk management and knowledge sharing. Ongoing training & development as well as on-the-job coaching address the skill aspect for risk management concepts and good practices. Risk Management effectiveness is also significantly dependent on the knowledge of the product that the project is seeking to deliver. For example, the product knowledge and prior experience in the Oracle CRM suite of products would be very useful for risk management in implementing a customer loyalty program based on the Oracle CRM suite. Proactive development of such product knowledge consistent with the organization’s business context is a must-have enabler. At the outset, let us clarify the distinction between enabler #3 which is skill and expertise. In the example cited under enabler #4 of implementing a customer loyalty program using the Oracle CRM suite, in addition to knowledge of the product (that is, the Oracle CRM suite), domain expertise in terms of CRM solutions in general and how loyalty programs work, say, in a specific industry context such as airlines, would take risk management practices to the level of greatness. Organizations need to address long term expertise development internally as well as spot assistance through external domain specialists. Well, those are the four enablers that we believe are key for risk management practice. Do you have anything to add to the list? How do you assess the state of enablers in your own organization and make them more effective? Watch this space for the next parts in this series – Risk Management: Good to Great – on practice measures and project outcomes.